How “real” Nürnberger Bratwurst immigrated to the USA. For decades many American butchers with German-sounding names have offered their customers something they call “Nürnberger Bratwurst”. Naturally, any real German living in the USA would get excited at the prospect of enjoying these juicy, little sausages once again. So, who can blame them for being disappointed when they discover that what they were being offered here in the USA would be outlawed in Germany? That’s right; outlawed! Germany adheres to strict production standards and the use of naming terms that legally protect items with an approved regional designation (Herkunftsbezeichnung). 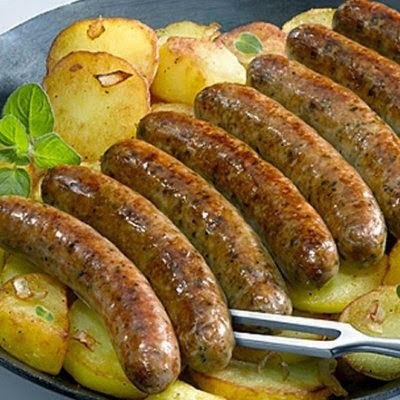 For a bratwurst to legally be called a “Nürnberger” it must be produced within the city limits of Nürnberg (Germany) according to the EU-Kommission. It must also be produced using very specific, high-quality ingredients and spices, all in the correct proportions. Size matters. Even the size of each sausage is carefully regulated. After all, Germans can trace the lineage of this tiny bratwurst all the way back to the medieval year of 1313, when the ancient city of Nürnberg adopted a charter to define standards that have stood the test of time. Read the legend* below about why they are so small. Fast-forward 700 years. The authentic “Made in Nürnberg” Bratwurst found itself standing in line at US Customs waiting for approval to enter the United States. It was time to show all those domestically-produced Nürnberger-wannabes (ersatz Nürnberger Bratwurst?) what a real one should look and taste like. But getting here had been no easy task for the little bratwurst. Stubborn Germans. That's what it took to get a passport for our heroic, little bratwurst. It took five years of effort, tons of money, and the steadfast determination of a famous German sausage-making company. HoWe Wurstwaren KG of Nürnberg was willing to jump through every Food and Drug Administration (FDA) hoop and leap across across every United States Department of Agriculture (USDA) hurdle to obtain the coveted insignia that allows this meat specialty to be imported to the USA. They simply refused to accept "nein!" as an answer. Ja! Ja! Ja! Expat-Germans were at the front of the line to welcome these tasty, little foreigners to America. For GermanDeli.com, the premier online German food retailer in the USA, the HoWe Nürnberger Bratwurst, and its big brother, HoWe Bavarian Bratwurst, quickly became top-selling must-haves. Americans are now discovering what Germans have known since the Middle Ages. The key ingredient in the juicy, little bratwurst with a famous name is authenticity! According to legend, Hans IV. Stromer (1517-1592), a judge in the medieval times, was imprisoned for life for revealing an important political secret. In those days, life-term in prison meant that once the dungeon doors were shut, you never again left your cell. Prisoners depended on family members for their food. Since he was a high ranking prisoner, Stromer was granted one reasonable wish. That wish was to be allowed 2 Bratwursts daily until the end of his days. So, his family made a bratwurst so small that it could be passed through the keyhole of the prison door. That bratwurst is now known as "Nürnberger Bratwurst" or variations of that name, based on region.